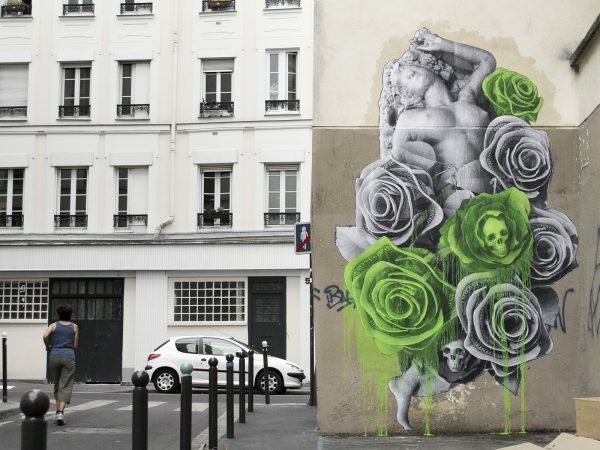 The French artist Ludo finished a new mural – The American Beauty – somewhere in Paris. 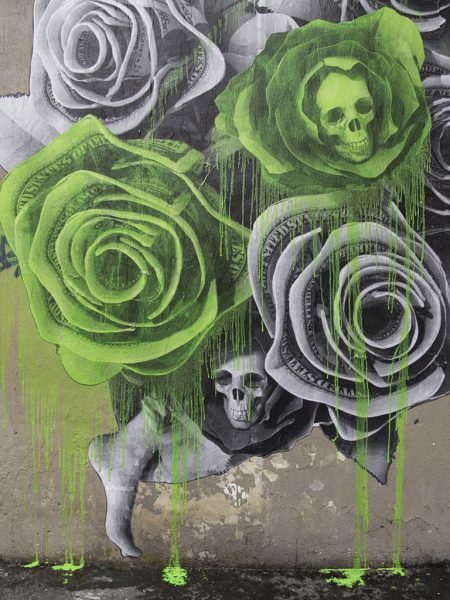 He created another mural which is featuring some of his so-called green-tinted imagery – showing some Dollar Roses coupled with Skulls. His work, often called Nature’s Revenge, shows a connection between the world of plants and animals and our technological universe – talking about what surrounds and affects us and tries to highlight some kind of humility. He mostly paints botanical illustrations, with a new order of hybrid organisms, which is both elegant and fierce. Those illustrations include for example, „armoured vehicles spawn stag beetle horns; carnivorous plants bare rows of hunting-knife teeth; bees hover, hidden behind gas masks and goggles; automatic weapons crown the head of sunflowers; human skulls cluster together like grapes“. Veröffentlicht in contemporary art, Graffiti, Murals, Paintings, street art, urban artGetaggt mit murals, outdoor, painting, spraypaint, streetart, urban artBookmark the permalink.